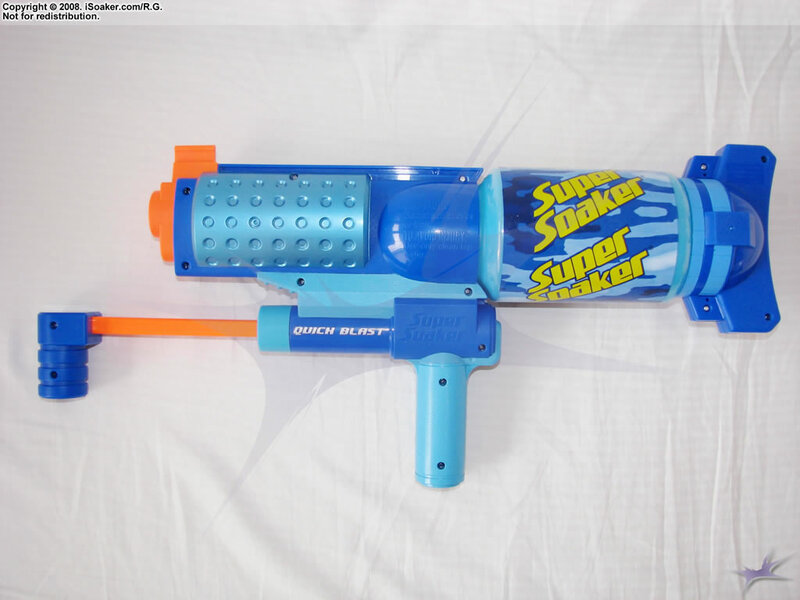 The Super Soaker Quick Blast is a novel pump-action blaster released in 2008 by Hasbro Inc. While a full pump yields a solid stream, a partial pump actually ends up storing pressure within the blaster. This makes for interesting stream performance from the Quick Blast. The Quick Blast features a single, slightly larger than average nozzle. Upon firing, the nozzle produces a respectably thick stream. The intriguing part is, unlike typical piston-based blasters, the Quick Blast will only fire once adequate pressure is applied on the nozzle valve. If one pulls the pump slowly, the blaster will not fire immediately, instead slowly building up pressure within its small pseudo-pressure chamber. When optimal pressure is reached, the nozzle valve snaps open, unleashing a potent stream. One single full pump is enough to get the blaster to fire. However, for those unable to push as hard on the pump, stream performance will still be quite good. When the nozzle valve is in its open position, force applied to the pump affects stream speed to some degree. What this nozzle prevents are dribble shots from a slowly pulled pump. One minor drawback is that there is no manual way to open the nozzle valve after use. Thus, the Quick Blast must be air-pumped several times, generating mist shots, in an attempt to flush out the internal pressure chamber. This makes it rather difficult to properly dry out the blaster after use. As noted already, the Super Soaker Quick Blast is a piston-based blaster, but it not necessaily fire from the nozzle with every pump. 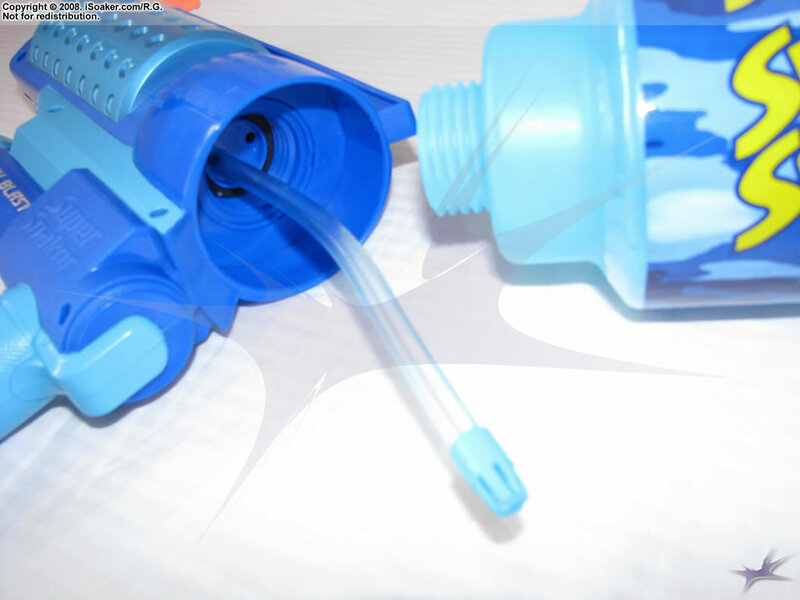 Despite not having a trigger, the Super Soaker Quick Blast has an internal spring-based pressure chamber that controls the nozzle valve. Enough water (or air, if cleaning) must be pumped into the pressure chamber before the blaster will fire. That said, one full length pump will push enough water into the pressure chamber to trigger the activation of the nozzle valve. Pumping, itself, is smooth and the pump pushes a respectable amount of water per cycle. 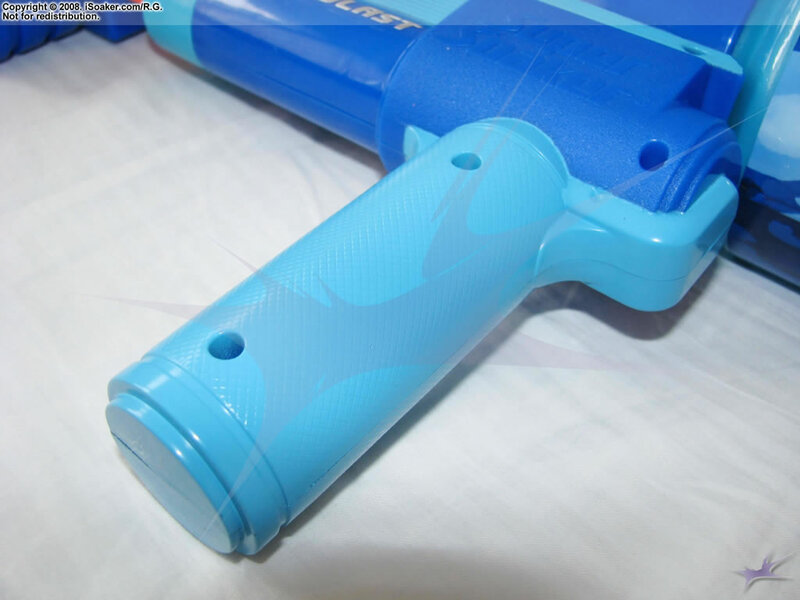 The pump grip has some texturing and has a hooked shape, making it easy hold and less likely to slip from one's hands even when wet. Thanks to the Quick Blast's nozzle valve, force of pumping does not directly translate into stream performance, with slow pumping still able to produce a relatively strong stream, though the firing will be delayed. There is no manual trigger on the Quick Blast. The grip, however, has a good size and length, accomodating even the largest of hands comfortably. The grip features some light texturing as well on its surface, making it fairly secure to hold. The reservoir on the Quick Blast holds a good amount of water for a blaster of its size. The choice to use a screw-on bottle with a long intake tube is a little odd as a fixed reservoir with a cap would have made for a more solid design. The intake tube can make use of the majority of the reservoir's contents, but cannot use the full volume. As well, due to the reservoir's placement with respect to the grip, the Quick Blast feels rather back-heavy when completely filled. The tail fin on the reservoir is strictly ornamental. Unforunately, on the model tested, the tail fin also rotated freely if turned, thus could not be used to assist in reservoir attaching or removal. As a whole, the Super Soaker Quick Blast is an interesting, decent, light, piston-based blaster. Thanks to its nozzle valve, the Quick Blast virtually always produces a good-powered stream (though it is possible to make the stream dribble if one tries). The main drawback is that there is a brief delay between pumping and stream generation. As well, if not enough pressure is generated on an incomplete pump, the Quick Blast will not fire at all. This can be of benefit for those who cannot pump as forcefully as streams from the Quick Blast have a minimum force to them. Then again, in the hands of an experienced water warrior, the Quick Blast can still be quite effective for its size. Overall, the Quick Blast can make for a great back-up or last resort blaster as well as a good option for small engagements or even scouting missions. Of course, versus larger water blasters capable of producing continuous streams, the Quick Blast's utility meets its limit. Simple styling, clean lines, and good solid feel to the soaker. Decent pump volume and reservoir capacity. Dribble shots virtually eliminated. Piston-based; continuous streams not possible. Delayed or even aborted firing if not enough pressure generated from pumping. Difficult to empty the pressure chamber; no manual way to open the nozzle valve. Screw-on bottle-type reservoir slows refilling. No strap.